What does this Strumming Symbol Mean? Re: What does this Strumming Symbol Mean? Looks like a symbol for a note to me. If the "ball" on the bottom end is full, it is a quarter not, if it's empty it's a half note. If it is a half note you would only play two of them per bar, if the tune is in four-four time. At least that's what I suggest without knowing how and where it's written exactly. I think I may have figured out what that strumming symbol means. It shows up in Justin Guitar Beginner's Song Book Volume 2 in songs like One by U2. 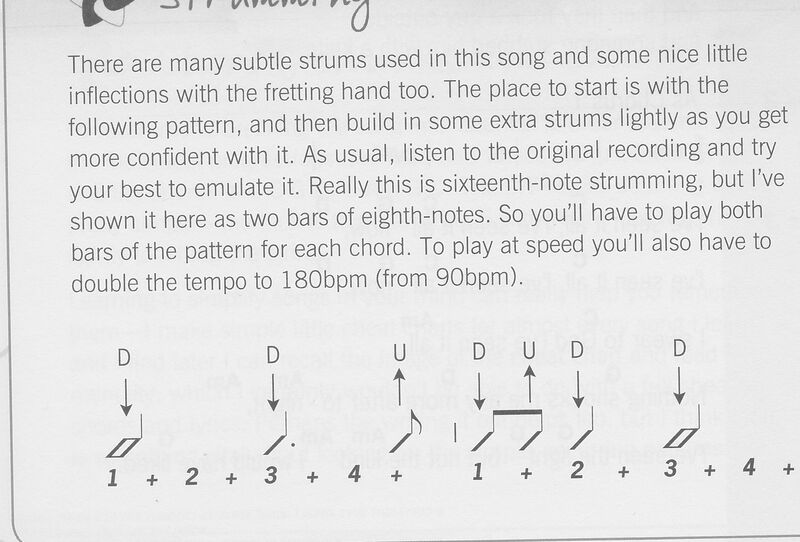 I THINK it means that the strumming is 16th note strumming, but it is being shown to beginners with 8th note strumming. Since it is shown as 8th note strumming it indicates playing the pattern twice as fast. That's my best guess. If anyone else has the Beginner's Songbook V2 please take a look at this song and let me know. You have enough posts now to post the link. That's a half note/minim down strum. It lasts for the count 1+2+ with a quarter note/crotchet down strum on count 3, followed by an eighth note/quaver up strum on the fourth + . The next bar is eighth note down strum on 1, eighth note up strum on +, quarter note down strum on 2 +, half note down strum on 3 + 4 +. Start again. That's a half note/minim down strum. The second note is a dotted quarter note, which prolongs it by half of its actual lenght. So it is basically three 8th notes long (a quarter + an 8th). Cheers. I missed the dot. It was early. I was hungover. Hey thanks for the replies. I think I makes sense to me. Also thanks for pointing out what that dot meant, I didn't even think to ask that. I guess my follow up question would be, say you have quarter note strums on beats 1 and 3. And nothing else. Would that imply muting the strings on beats 2 and 4 so that the notes don't ring out too long? Would you mind re-posting that link? It appears to be dead, and I'd like to read that article. Jeff, I believe there is a rest symbol on the second beat in that case. Yes, you will never see note timing values that don;t add up to a whole measure. A quarter on 1 and 3 means there also will be some sort of accounting for the quarters on 2 and 4. So they either need to be rests or some other combination note values that add up to two quarters. 4 quarters = 1 whole. You always need a WHOLE measure. If it were 3/4 time of course you would only need to account for the single quarter on beat 2. In this case 3 quarters = 1 Whole.